Allow me to introduce you to Mapleton-Fall Creek. 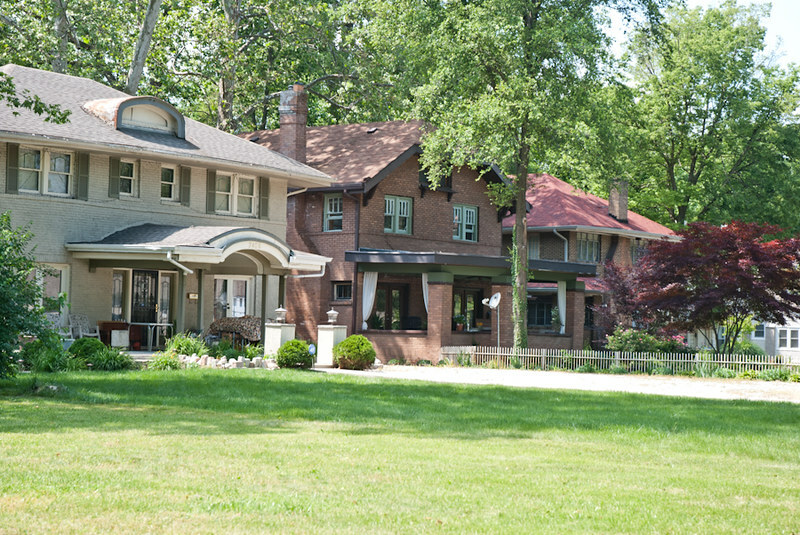 A neighborhood rich in history, diversity and nature that’s only a hop-skip and a jump from downtown Indianapolis. It has been the focus of a MidNorth Quality of Life Plan that is related to the mural I will be discussing shortly, take a gander here. When we first came across our home in Mapleton-Fall Creek we were so enthusiastic about the amazing house – full of character, charm and potential, that we neglected to evaluate our surroundings. Yes, of course we did wind up evaluating our area prior to signing the dotted line, and on paper, and it had potential. 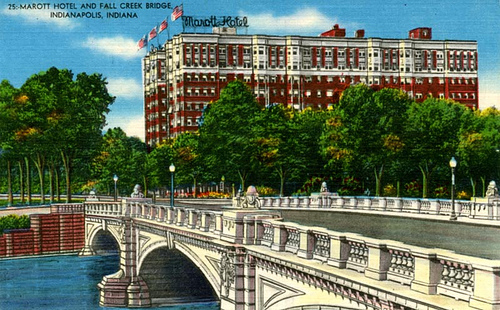 Long history short – it was its own town back in the 1800s, well to do, wealthy and boasted architectural gems of bridges. However, as many good stories do, it had it’s “ugly” period. It went through a time of great struggle, violence, racism and a turn for boarded up, abandoned homes. Currently it has a substantial amount of break-ins, gang activity, drugs and prostitution, among other crimes. 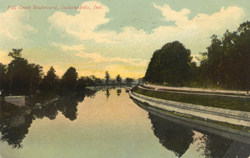 (For anyone looking at homes here, check out your potential area on the crime view map) Read a great overview of it on the Historic Indianapolis blog and an even more detailed history at the Polis Center site, if you’re interested. Did you catch that? 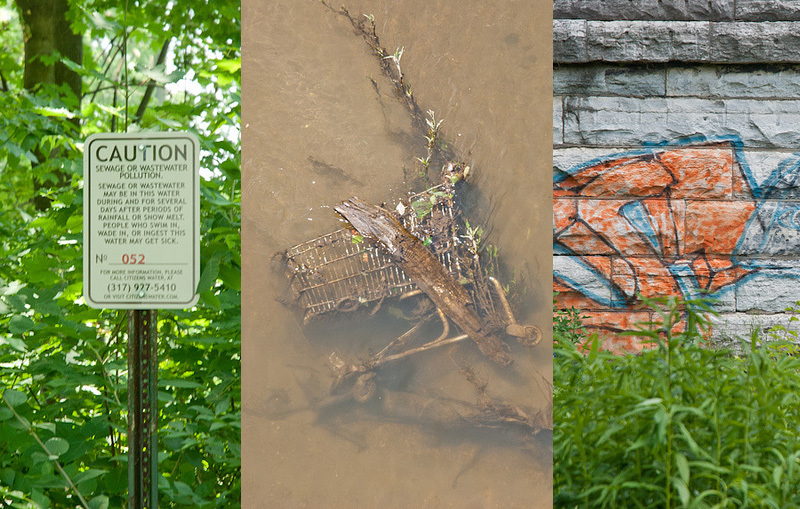 Folks we’ve got sewage, garbage, graffiti and so many invasive species half the people flying by on the parkway probably don’t even realize there is water running along side them. But it still has potential. The husband and I were determined to do what we could to help our neighborhood. Sure, we work full time and are total weekend warriors when it come to the home improvement side of things. . . but surely we can do something. After several months of searching, we tracked down the Mapleton Fall Creek Neighborhood Association. Oh Lord. I can’t even begin to describe our disappointment in the association. However, we did manage to meet several AMAZING neighborhood go-getters as well as get connected to the MFCDC. No one from our street, mind you, but at this point, we just wanted to be involved however we could be. Somewhere in there, we met Doug. Doug Day of Destination Fall Creek. He exuded enthusiasm for the potential. Doug has been paving the way for the potential to explode. He has worked with numerous organizations to actually make things happen (which is more than I can say for the neighborhood association). October 11, 2012 is the Lilly Day of Service. This day became a staple in the minds of those of us working on Destination Fall Creek. For October 11th of this year, it was determined one of the Lilly Day of Service projects was to partner with Reconnecting our Waterways and Destination Fall Creek to deploy 2,000 employees to the task of removing invasive species, cleaning up Fall Creek and creating public art by way of a mural. Months of work by Doug, the MFCDC, and others pulled together a selection of local artists proposals for the mural, narrowed it down to three, then two, then the final selection. 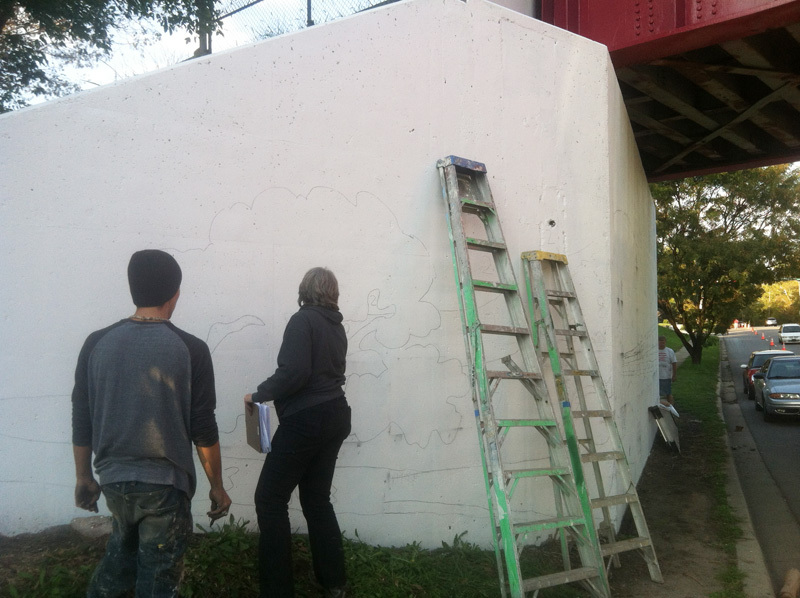 The artist had created a mural that would satisfy the need of showcasing the beautiful blending of nature, homes and activities that everyone in our neighborhood had the opportunity to take part in. The original intent was to utilize the colors from the Quality of Life Pinwheel in a muted quality to coordinate with the older homes running along Fall Creek. In hindsight, the artist had it right. Blend the colors. . .as one who loves color, I too agreed with the bright color concept (and still wouldn’t mind it) but after the past several days, I would encourage the more muted colors with the assurance they would be coated to resist fading. The design was simple enough that those whizzing down Fall Creek Parkway could take it in without too much thought but complex enough that those of us staring directly at the large wall wouldn’t be bored by a monotonous design. Great thought and discussion went into the process of determining color, tweaks to the design and finally, the execution of placing the design to the wall. A group of us coordinated a time to go door to door to talk with neighbors. The husband and I were delighted to FINALLY meet some of the people we’d been occupying the same street with. Many were happy to not only see other people who, like them, lived on this road in an old house but to see people finally DOING something. We met people who had lived on this street for 10, 20, 30 years! Incredible! They had words of encouragement, enthusiasm and anticipation for the positive things to come of the ever present, potential. We encouraged them to voice their concerns. . . because, for once, the neighbors were actually talking. Transferring of the design to the wall. It’s also held Mrs. L going door to door with her petition to stop the mural. She’s managed to collect 17 names. . . at least 10 of which are names of people who do not even reside near Mapleton-Fall Creek. At least one person has repeatedly called the Mayor’s action line to continuously voice their displeasure. Funny. I don’t recall this much fervor in response to vandalism and break-ins in the neighborhood. . . So, with that damage done. Lilly is now fearful of pursuing this public art venture. Rightfully so, this is their one HUGE day of great PR. No one wants a negative spin placed on such an awesome day for the Indianapolis community. We get that. Regardless of the paint being put on the walls or not, good will be done in the area and I am grateful for that. However, I am so disheartened by the actions of the two couples along this street. Some actions I refuse to place on this blog. . . as I have a difficult time believing honest citizens would be so childish. Well said my friend! May a compromise be found to move your potential into reality! As one of the neighborhood residents who have spent the past 18 months participating in the Mid-North Quality of Life Planning Process, I will be extremely disgusted if two (non-participating) families can undermine and undo all of the hard work that has been done in the QOL process. As someone who lives in the neighborhood and has to look at the wall everyday, I’m in total agreement with the families against the current design. A more tasteful, neighborhood appropriate compromise should be reached if ALL residents of the neighborhood were included in such decisions. Hi R, thanks for your civil comment of disagreement. I am actually full in favor of everyone on our street talking about this and finding a viable option. I’m delighted that this has stirred up conversation, good, bad and ugly and may lead to something everyone can support. Sometimes, it takes more than a flier or a knock on the door to provoke action. There will be a meeting this afternoon regarding the future of the mural. If you are interested in joining, please contact either Doug or Mark for more information. Again, thank you for your comment.